Looking for something to do this Saturday, Oct 5? 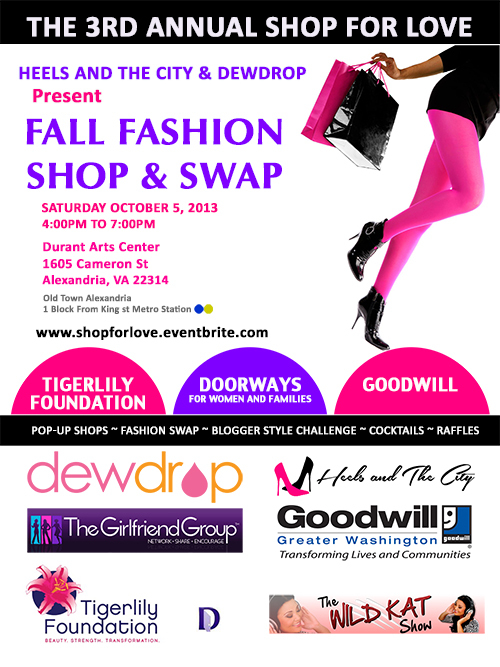 Check out the charity swap party and vendor showcase hosted by Dewdrop. From 4-7pm at the Durants Arts Center in Old Town Alexandria, you can enjoy yummy treats and refreshments while shopping various pop-up shops and participating in the swap at the end of the event. Proceeds from the event will go to the Tigerlily Foundation and Doorways in support of breast cancer and domestic violence awareness months. All unswapped items will be donated to Goodwill. Dewdrop provides information on how to prepare for the swap. Click HERE for the link. To grab your ticket, visit: shopforlove.eventbrite.com. Go out and support this great charity event! Categories: Uncategorized | Tags: charity, events, pop up shop, swap, vendors, vintage clothes | Permalink.